The newly devised piece that I’ve been working on here at ASU finally opened this last weekend. Named “The Fall of the House of Escher” the production explores concepts of quantum physics, choice, fate, and meaning through by combining the works of MC Escher and Edgar Allen Poe. The production has been challenging in many respects, but perhaps one of the most challenging elements that’s largely invisible to the audience is how we technically move through this production. Early in the process the cohort of actors, designers, and directors settled on adopting a method of story telling that drew its inspiration from the Choose Your Own Adventure books that were originally published in the 1970’s. In these books the reader gets to choose what direction the protagonist takes at pivotal moments in the drama. The devising team was inspired by the idea of audience choice and audience engagement in the process of story telling. Looking for on opportunity to more deeply explore the meaning of audience agency, the group pushed forward in looking to create a work where the audience could choose what pathway to take during the performance. While Escher was not as complex as many of the inspiring materials, its structure presented some impressive design challenges. Our production works around the idea that there are looping segments of the production. Specifically, we repeat several portions of the production in a Groundhog Day like fashion in order to draw attention to the fact that the cast is trapped in a looped reality. Inside of the looped portion of the production there are three moments when the audience can choose what pathway the protagonist (Lee) takes, with a total of four possible endings before we begin the cycle again. The production is shaped to take the audience through the choice section two times, and on the third time through the house the protagonist chooses a different pathway that takes the viewers to the end of the play. 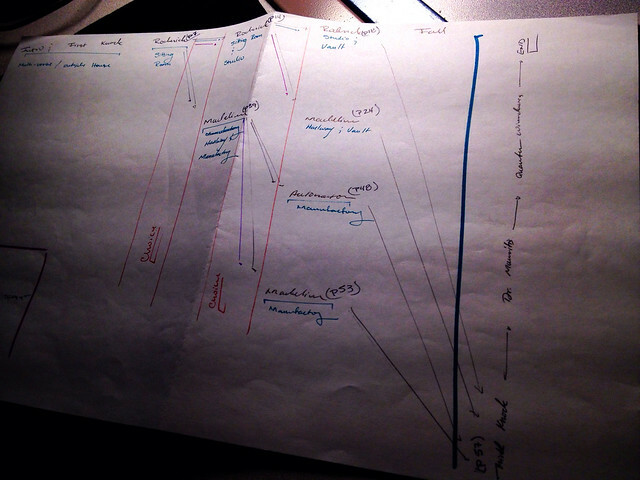 The number of internal choices in the production means that there are a total of twelve possible pathways through the play. Ironically, the production only runs for a total of six shows, meaning that at least half of the pathways through the house will be unseen. This presents a tremendous challenge to any designers dealing with traditionally linear based story telling technologies – lights, sound, media. Conceiving of a method to navigate through twelve possible production permutations in a manner that any board operator could follow was daunting – to say the least. This was compounded by a heavy media presence in the production (70 cued moments), and the fact that the scrip was continually in development up until a week before the technical rehearsal process began. 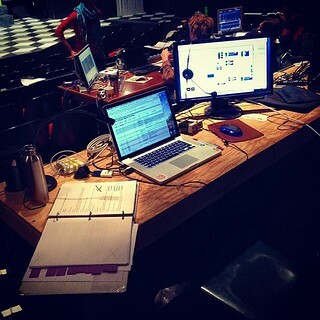 This meant that while much of the play had a rough shape, there were changes which influenced the technical portion of the show being made nearly right up until the tech process began. The consequences of this approach were manifest in three nearly sleepless weeks between the crystallization of the script and opening night – while much of the production was largely conceived and programmed, making it all work was its own hurdle. In wrestling with how to approach this non-linear method, I spent a large amount of time trying to determine how to efficiently build a cohesive system that allowed the story to jump forwards, backwards, and sidewise in a system of interactive inputs, and pre-built content. The approach that I finally settled on was thinking of the house as a space to navigate. In other words, media cues needed to live in the respective rooms where they took place. Navigating then was a measure of moving from room to room. This ideological approach was made easier with the addition of a convention for the “choice” moments in the play when the audience chooses what direction to go. Have a space that was outside of the normal set of rooms in the house allowed for an easier visual movement from space to space, while also providing for visual feedback that for the audience to reinforce that they were in fact making a choice. Establishing a modality for navigation grounded the media design in an approach that made the rest of the programming process easier – in that establishing a set of norms and conditions creates a paradigm that can be examined, played with, even contradicted in a way that gives the presence of the media a more cohesive aesthetic. While thinking of navigation as a room-based activity made some of the process easier, it also introduced an additional set of challenges. Each room needed a base behavior, an at rest behavior that was different from its reactions to various influences during dramatic moments of the play. Each room also had to contain all of the possible variations that existed within that particular place in the house – a room might need to contain three different types of behavior depending on where we were in the story. I should draw attention again to the fact that this method was adopted, in part, because of the nature of the media in the show. The production team committed early on to looking for interactivity between the actors and the media, meaning that a linear asset based play-back system like Dataton’s Watchout was largely out of the picture. It was for this reason that I settled on using troikatronix Isadora for this particular project. Isadora also offered opportunities for tremendous flexibility, quartz integration, and non-traditional playback methods; methods that would prove to be essential in this process. In building this navigation method it was first important to establish the locations in the house, and create a map of how each module touched the others in order to establish the required connections between locations. This process involved making a number of maps to help translate these movements into locations. While this may seem like a trivial step in the process, it ultimately helped solidify how the production moved, and where we were at any given moment in the various permutations of the traveling cycle. 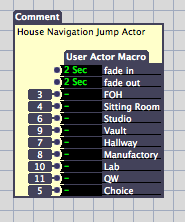 Once I had a solid sense of the process of traveling through the house I built a custom actor in Isadora to allow me to quickly navigate between locations. This custom actor allowed me to build the location actor once, and then deploy it across all scenes. Encapsulation (creating a sub-patch) played a large part in the process of this production, and this is only a small example of this particular technique. 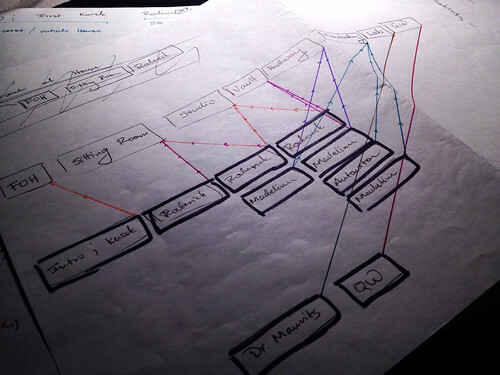 The real lesson to come out of non-linear story telling was the importance on planning and mapping for the designer. Ultimately, the most important thing for me to know was where we were in the house / play. While this seems like an obvious statement for any designer, this challenge was compounded by the nature of our approach: a single control panel approach would have been too complicated, and likewise a single trigger (space bar, mouse click, or the like) would never have had the flexibility for this kind of a production. In the end each location in the house had its own control panel, and displayed only the cues corresponding to actions in that particular location. For media, conceptualizing the house as a physical space to be navigated through was ultimately the solution to complex questions of how to solve a problem like non-linear story telling. This entry was posted in Design, Escher, How-To, Isadora, Live Performance, media design, production, Theory and tagged Arizona State University, ASU, edgar allen poe, graduate school, Media, media design, playback design, production, programming, quantum physics on September 29, 2013 by raganmd.